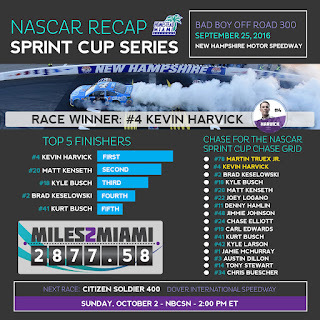 · Kevin Harvick won the 20th Annual Bad Boy Off Road 300 NASCAR Sprint Cup Series race Sunday afternoon. For Harvick, it is his 34th victory in 566 NASCAR Sprint Cup Series races. · It is Harvick’s third victory and 22nd top-10 finish in 2016. 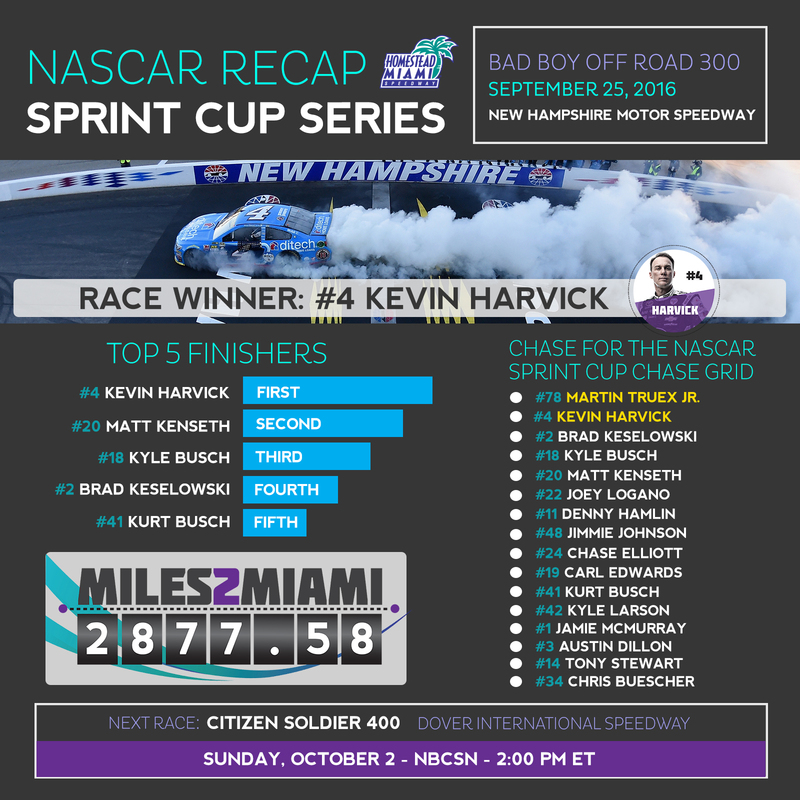 · It is Harvick’s second victory and 17th top-10 finish in 232 races at New Hampshire Motor Speedway. · With Harvick’s win on Sunday, it is the seventh time in his 16-year career where he has three or more wins. · Matt Kenseth (second) posted his 19th top-10 finish in 34 races at New Hampshire Motor Speedway. · It is Kenseth’s 13th top-10 finish in 28 races this season. · Kyle Busch (third) posted his 13th top-10 finish in 24 races at New Hampshire Motor Speedway. · It is Kyle Busch’s 12th top-5 and 18th top-10 showing of 2016. · Brad Keselowski finished fourth on Sunday, giving him his fifth top-10 finish in a row. It is his second top-5 showing in the Chase. · Kurt Busch (fifth) posted his seventh top-5 and 18th top-10 showing this year. · Following Sunday’s Chase for the NASCAR Sprint Cup race at New Hampshire Motor Speedway, there are now only 2,877.58 #Miles2Miami. The 2016 Chase for the NASCAR Sprint Cup will culminate at Homestead-Miami Speedway with the Ford EcoBoost 400 championship race on November 20. · Elliott Sadler won the 5th Annual VisitMyrtleBeach.com 300 XFINITY Series race at Kentucky Speedway Saturday night. It was his 13th victory in 323 NASCAR XFINITY Series races. · With the victory, Sadler moves into a tie with Martin Truex Jr. and Darrell Waltrip for 24th on the all-time series wins list. · It is Sadler’s third victory and 24th top-10 finish in 2016. · It is Sadler’s first victory and eighth top-10 finish in 11 races at Kentucky Speedway. · Sadler clinched a spot in the NASCAR XFINITY Series Chase Round of 8 with the win. · Sadler leads the NASCAR XFINITY Series Chase points standings by eight points over Daniel Suarez. · William Byron won the 19th Annual UNOH 175 Camping World Truck Series race at New Hampshire Motor Speedway Saturday afternoon. It is his sixth victory in 18 NASCAR Camping World Truck Series races. · It is Byron’s sixth victory and 11th top-10 finish in 2016. · It is Byron’s first victory and first top-10 finish in one race at New Hampshire Motor Speedway. · Byron clinched a spot in the NASCAR Camping World Truck Series Chase Round of 6 with the win. · Byron leads the NASCAR Camping World Truck Series Chase points standings by 16 points over Matt Crafton.